Step back in history and ride in the tracks of Africa’s early explorers. Stories of grand discoveries inspire as we set off on our own equestrian adventure, in an environment that looks as it did one hundred years ago. On an equine safari, you are as close to nature as you will ever get. The wildlife is completely at ease in the presence of horses. Herd animals in particular will take the horses into their stride, riding with you for miles and miles. 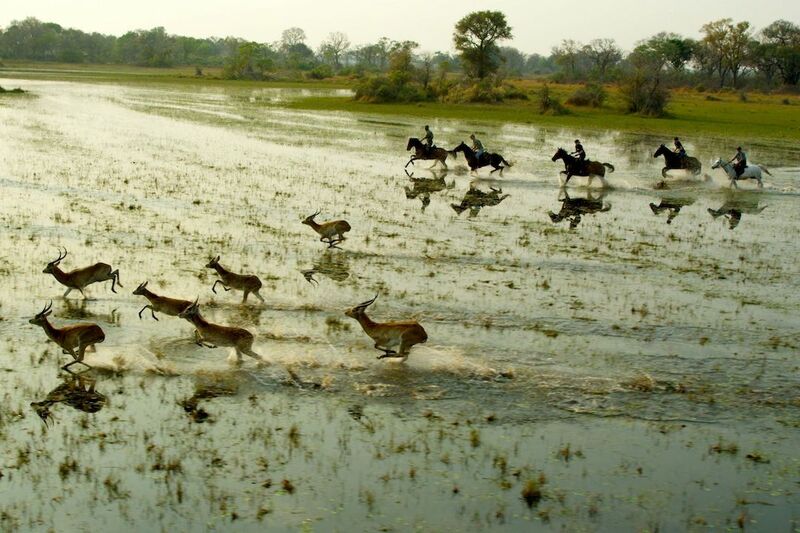 To canter alongside the graceful movement of a giraffe, splash through shallow lily-covered waters next to a herd of lechwe, and progress silently along game paths is unforgettable. On horseback, you can explore wilderness areas that are inaccessible by vehicle, and you can cover miles as you develop a close relationship with your horse and the nature that surrounds you. Instead of the sounds of the 4×4 engine revving beneath you, you will hear the sounds of hooves kicking up dirt just under your feet. On horseback, you are no longer just an observer of nature—you become a part of it. We invite you to browse through our range of equine safaris, and get in touch with us to begin planning your adventure. Experience Botswana’s unique beauty and spirit while cantering alongside its wildlife.